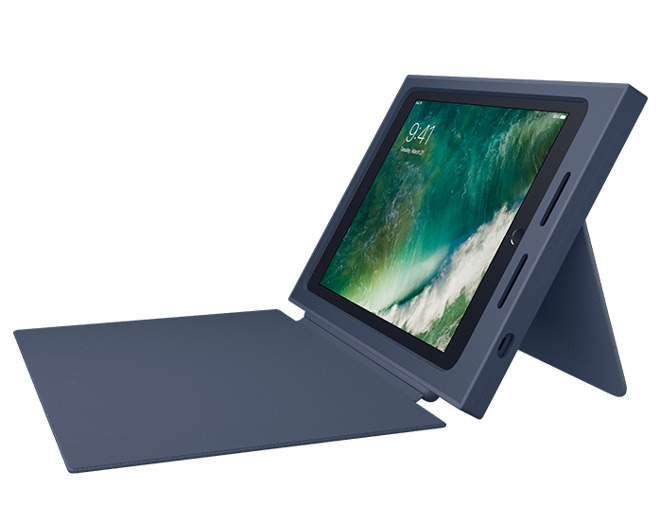 Hot on the heels of Apple revealing a new budget iPad, Logitech on Tuesday debuted a matching case and keyboard combo intended exclusively for Canadian and American schools. The Rugged Case is designed to protect against drops up to 6 feet, using polymer "ribs" surrounding the edges. Luggage-style fabric protects against wear and liquids, while a detachable cover can be used to guard the screen. A kickstand with mechanical hinges supports angles between 20 and 60 degrees. The back also features a transparent window, meant to show tagging and/or barcodes schools typically put on electronics. The cover can be replaced with a optional add-on keyboard, which uses a proprietary Logitech connector and draws power from the iPad so it doesn't have to be recharged on its own. It also offers a wide, laptop-like layout, and a row of function and shortcut keys. While schools will be able to buy the two accessories separately, a Rugged Combo pack pairs the two together. Pricing has yet to be announced. Schools will be able to buy the gear later this week through Apple's specialized shopping portal. The new iPad starts at $329 for the average buyer, and goes on sale this Friday. It comes with an A9 processor, and 32 or 128 gigabytes of storage.